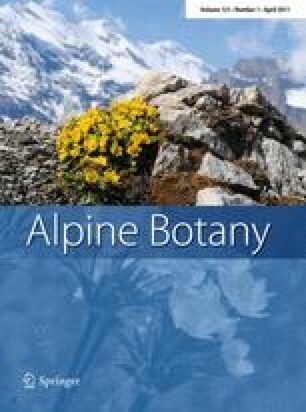 The highest elevation flowering plant ever recorded in Europe, a lush moss flora, one of the coldest places of permanent animal life (collembola, mites) and indications of mycorrhizal fungi were evidenced for the Dom summit (4,545 m, central Swiss Alps) between solid siliceous rock at 4,505–4,543 m, 46° N. Cushions of Saxifraga oppositifolia were found at 4,505 to 4,507 m a.s.l. A large individual (possibly >30 years old) was in full bloom on 12 August 2009. The 14C-dated oldest debris of the biggest moss, Tortula ruralis, suggests a 13 year litter turnover. The thermal conditions at this outpost of plant life were assessed with a miniature data logger. The 2008/09 growing season had 66 days with a daily mean rooting zone temperature >0 °C in this high elevation micro-habitat (2–3 cm below ground). The degree hours >0 °C during this period summed up to 4,277 °h corresponding to 178 °d (degree days), the absolute winter minimum was −20.9 °C and the absolute summer maximum 18.1 °C. The mean temperature for the growing period was +2.6 °C. All plant parts, including roots, experience temperatures below 0 °C every night, even during the warmest part of the year. On clear summer days, plants may be physiologically active for several hours, and minimum night temperatures are clearly above the freezing tolerance of Saxifraga oppositifolia in the active state. In comparison with climate data for other extreme plant habitats in the Alps, Himalayas, in the Arctic and Antarctic, these data illustrate the life conditions at what is possibly the coldest place for angiosperm plant life on earth. I thank Jürg Anderegg for guiding me to the Dom summit in 2008 and collecting the logger and samples in 2009, Ulrike and Roman Hörler for teaming up during the 2008 climb, David Preiswerk for searching for the second summit logger in 2010 and recovering the loggers from 3,060 m elevation, and Inger Alsos for recovering the Svalbard logger. I thank the Jungfraujoch High Altitude Research Station for permission and assistance during the 2010 logging campaign. The taxonomic expertise by Erwin Urmi (University of Zürich; mosses), by Hans-Jürgen Schulz (collembola) and Axel Christian (mite; both Senckenberg Museum, Görlitz, Germany) and Fritz Oehl (Agroscope Reckenholz-Tänikon Research Station, Zürich; soil fungi) is gratefully acknowledged. Scanning electron micrographs have kindly been provided by the Center for Electron Microscopy of the University of Basel (Daniel Mathys), light microscope images were provided by Fritz Oehl (fungi, seeds) and Ulrich Burckhardt (collembola). Thanks to the isotope lab (Rolf Siegwolf) at the Paul Scherrer Institute, Villigen, Switzerland, for 13C measurements, and the Laboratory for Ion Beam Physics (Irka Hajdas and Lukas Wacker), Swiss Federal Institute of Technology, Zürich for 14C dating of moss debris, to Susanna Riedl for helping with sample handling, diagrams and literature, Urs Weber for taking the Saxifraga macro-photographs of fresh samples and work on the manuscript, Maria Brassel for providing photographs 2a, b, Jens Paulsen for processing the climate data. Thanks also to Inger Alsos, Georg Armbruster, Burkhard Büdel, Allan Green, Otto Hegg, Heiner Lenzin, Bruno Messerli, Volker Storch and Johanna Wagner for advice during preparation of the manuscript. Jiří Doležal provided the original climate data from the Himalaya survey (for additional analysis) that he published with the late Leoš Klimeš. Erika Hiltbrunner, Jürg Stöcklin and two anonymous referees helped improving the manuscript. Thanks to all.